1. When you GOOGLE MAP the address, it will take you to the front entrance (not the parking garage) of the Constitution Center on Arch St. If you decide to street park, that is up to you. You can not park in front of the Center on Arch St. You may need a few blocks to find a spot. 2. Easy Garage Parking: $9. It is attached to the Constitution Center. It is located BEHIND the Constitution Center on RACE ST. We recommend this option. It is easy and inexpensive for Philadelphia parking. 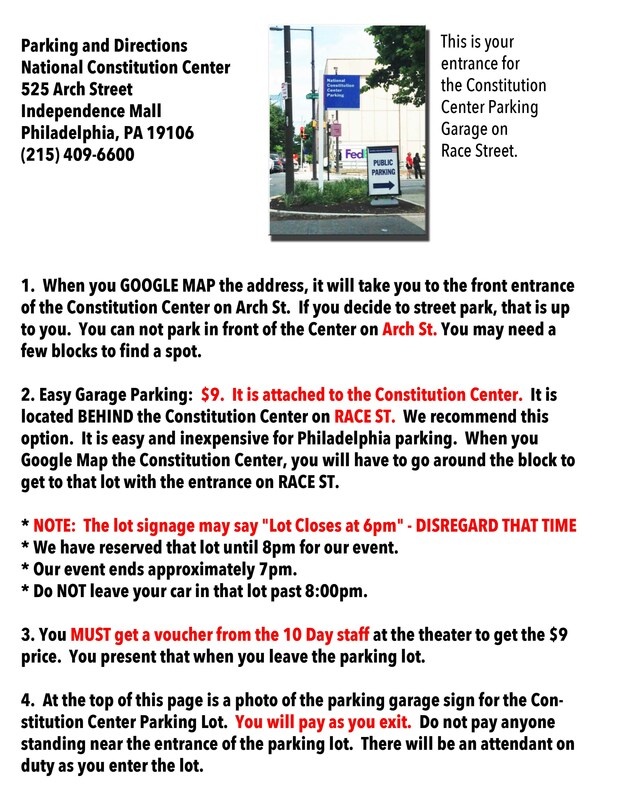 When you Google Map the Constitution Center, you will have to go around the block to get to that lot with the entrance on RACE ST.
* NOTE: The lot signage will say "Lot Closes at 6pm"
* We have reserved that lot until 6pm for our event. * Our event ends approximately 5pm. * Do NOT leave your car in that lot past 6:00pm. 3. You MUST get a voucher from the 10 Day at the theater to get the $9 price. You present that when you leave the parking lot. 4. Below is a photo of the parking garage sign for the Constitution Center Parking Lot. You will pay as you exit. Do not pay anyone standing near the entrance of the parking lot. There will be an attendant on duty as you enter the lot.